Some people ask, what’s up with the Sony A700 vertical grip? Why is the shutter button not at the corner of it? Xian Jin, with a Nikon D80, Nikkor AF-D 85mm F1.8 and the MB-D80 battery grip. Notice that his right hand is higher up. 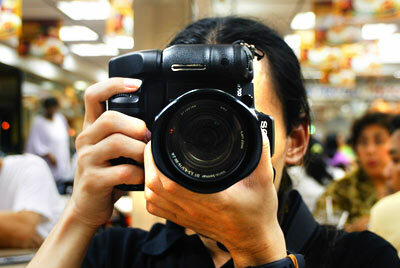 In fact, he is pulling the camera up so that his left eye will be able to look through the viewfinder. 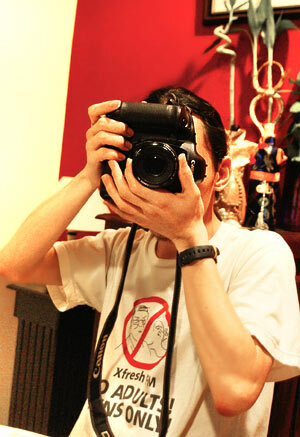 Me with Asyraf‘s Canon EOS 1Ds Mk I with Canon 50mm F1.8 Mk II. With this, the vertical grip is built into the body. Personally, it felt like I wish my left eye was at the same level as my nose to hold this more comfortably. My right hand certainly felt like it was reaching for the top level of a cupboard. The 50mm is a slow focuser with the 1Ds, but that’s another story. 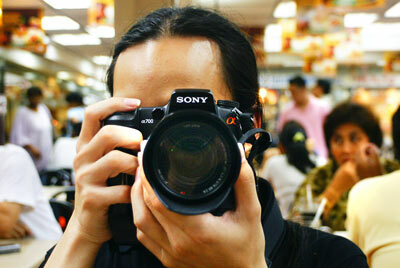 However, this is not so with the Sony Alpha 700, Sony Carl Zeiss 16-80mm F3.5-4.5 DT and Sony VG-C70AM portrait grip. (This is not mine; it’s George‘s.) My right hand no longer feels awkward, and I can lower my elbow, for better stability. Also, more of the camera’s weight is held by my right hand. Thanks to KJ for taking this shot. Also, the joystick and all buttons accessible by the right hand are duplicated on the vertical grip. This is different from say, the Canon 40D, which has fewer buttons, and you cannot reach the joystick when in portrait mode without stabbing your eye first. An added bonus is that the Drive, WB and ISO buttons which are originally harder to reach with the right hand in landscape orientation are now very easy to reach with the left hand. Also, the Fn button of the A700 can be reached with your left thumb in portrait orientation! A normal landscape orientation grip. Note that the distance between both hands is almost the same in both landscape and portrait grip! This entry was posted in Geek, Pictures on November 13, 2007 by 2konbla. Yah have to agree totally, the ergonomics of most camera grips aren’t that great as you feel unbalanced holding the camera as you have to put your face rather lower than your hand. Smart move on the A700 grip, surely more comfortable and a more stable position for holding the camera in portrait orientation. I tend to still use the normal shutter release even when using a grip as I find it more comfortable gripping the camera from the top middle rather than the side above my face. the grip for @700 is totally something new for a DSLR..
although it’s Rm1k for the grip.. but somehow it’s worth it..
ShaolinTiger: Heh, I think that I might instinctively do the same when I need to quickly flip to vertical position, instead of repositioning my right hand! I wonder why though, third-party manufacturers did not pick up on this. DiCain made a vertical grip like this for the A100, which was based on the vertical grips from the Minolta days. XJ: Oops! Corrected. No wonder it felt weird trying to match the scale of both cameras with what I thought were 50mm lenses! KJ: It’s new in the sense that it has all the buttons and joystick. However, the placement of the shutter has been around since Minolta, yay! so it *isn’t* wrong to rotate the camera clockwise lah? phew! i’ve always had the habit of doing that and i’ve never seen other people do it. so i’m kinda relieved to know that i’m not the only one lol. yea sometimes its faster to just rotate the cam n use the usual shutter button. yeah, i agree! it does feel more sturdy that way. plus, it feels awkward sometimes to have your arm loop one big round when you rotate it counterclockwise. and do blog about the alternative portrait position. i’m curious to know! Melissa: I just realized that your blog’s picture has it held that way. Sometimes, I hold it that way when I’m tired of holding it the other way, or when I want to peer leftward around a wall. It also feels nicer on the wrist, donchathink? Melissa: Yup yup! It also gives a slightly different angle; I’d go clockwise if I needed to shoot something more from the left, and anti-clockwise when I wanna shoot something more from the right. Shooting upside-down helps with peering over ledges.